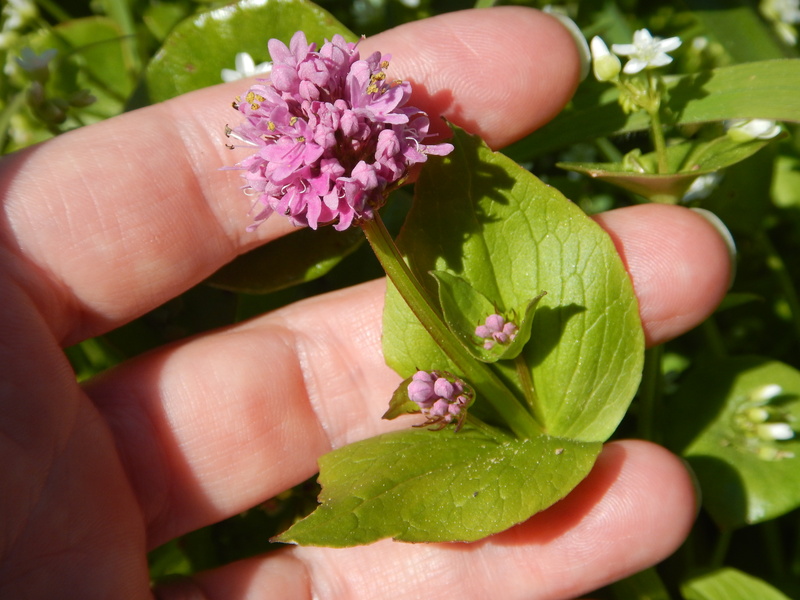 There seems to be a buzz about Playfair Park this spring – and it’s not just the pollinators. Several people have told me about how spectacular its Camas meadow is. Of course, I had to check it out. I used to think that Camas meadows were beautiful gifts from Mother Nature, but it turns out she’s had a helping hand. 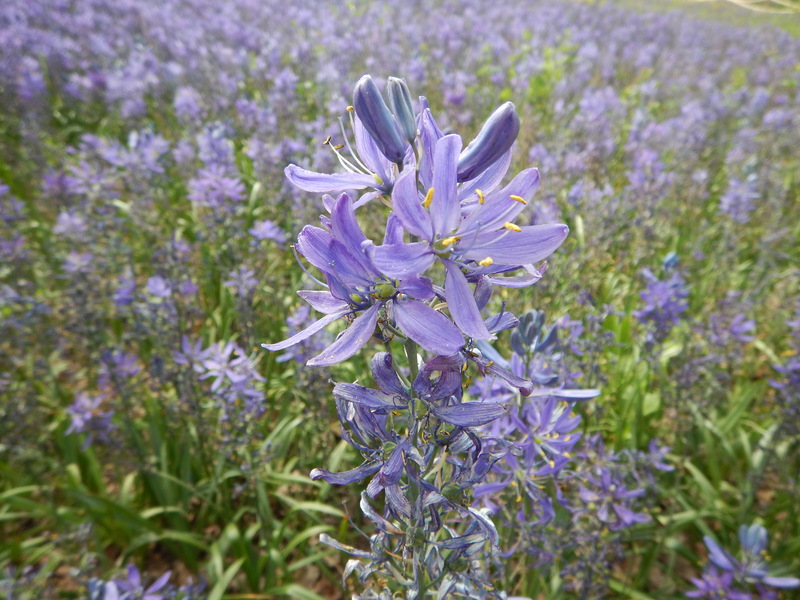 First Peoples farmed Camas for its food value. Their work created more intense swaths of blue each spring. 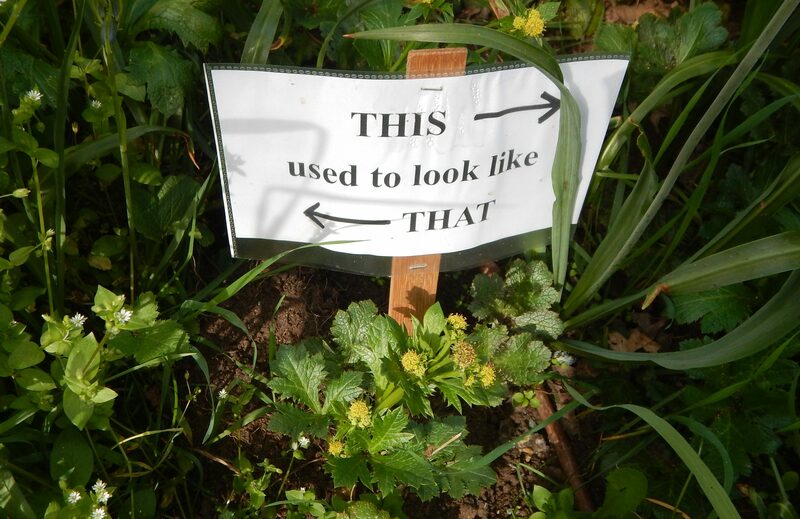 Left untended these fruitful fields decline & are overtaken by more dominant species. 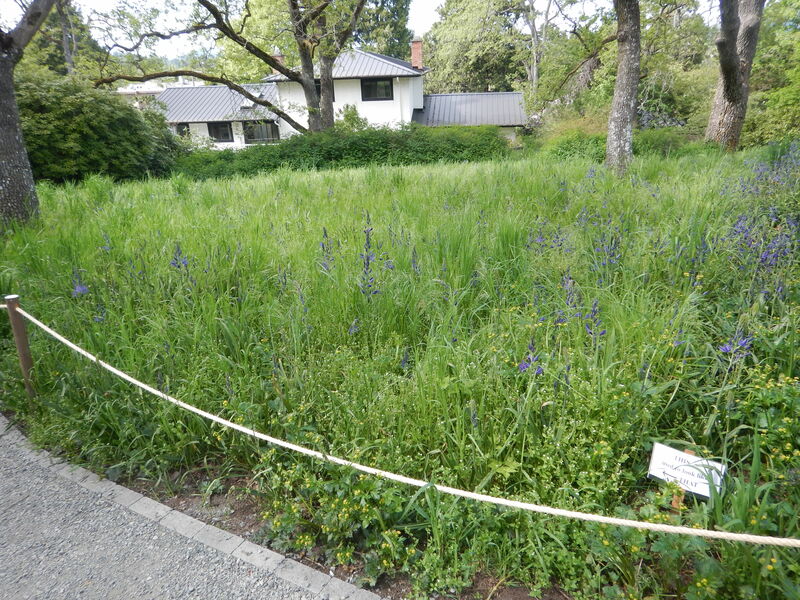 The Camas fields that are now Playfair Park succumbed to invasive grasses and introduced species. Fortunately, volunteer Colleen OBrien came on the scene around 2010 with grand ideas, determination and stamina. Over many years she’s gained the respect & cooperation of Saanich Parks, and their Pulling Together Program. The Common Camas bloom (Camas quamash) was pretty much over when I arrived, but the Great Camas (Camassia leichtlinii) was in full glory. I stopped in my tracks, slack-jawed. It was so much more intense than I’d expected. Seablush (Plectritis congesta) on rocky outcrops will grow happily at only ankle height. 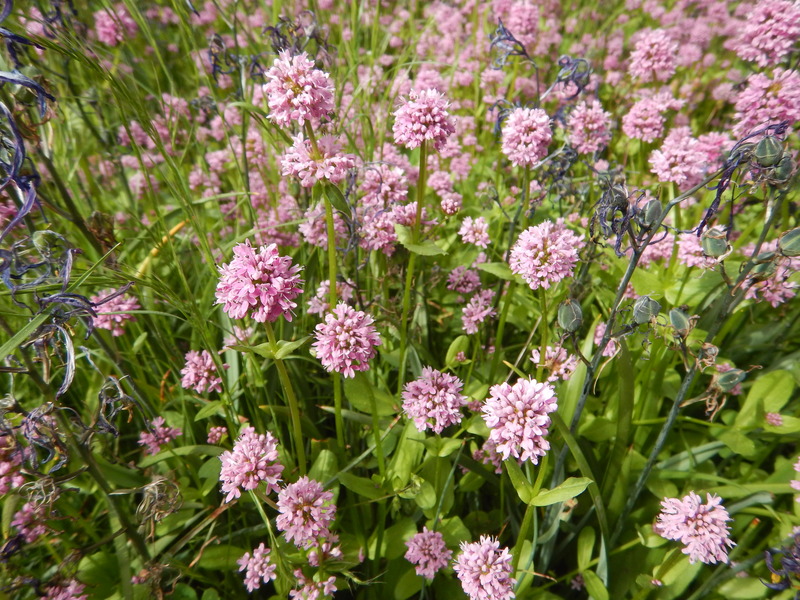 In a deep soil meadow, it reaches my knees in little explosions of pink joy. 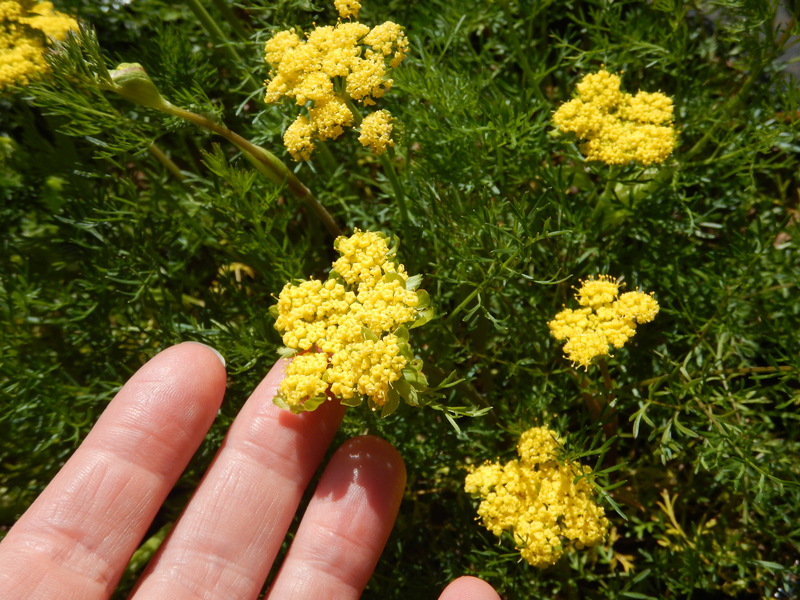 Spring Gold (Lomatium utriculatum) is the most recognized punch of color contrasting the Camas. 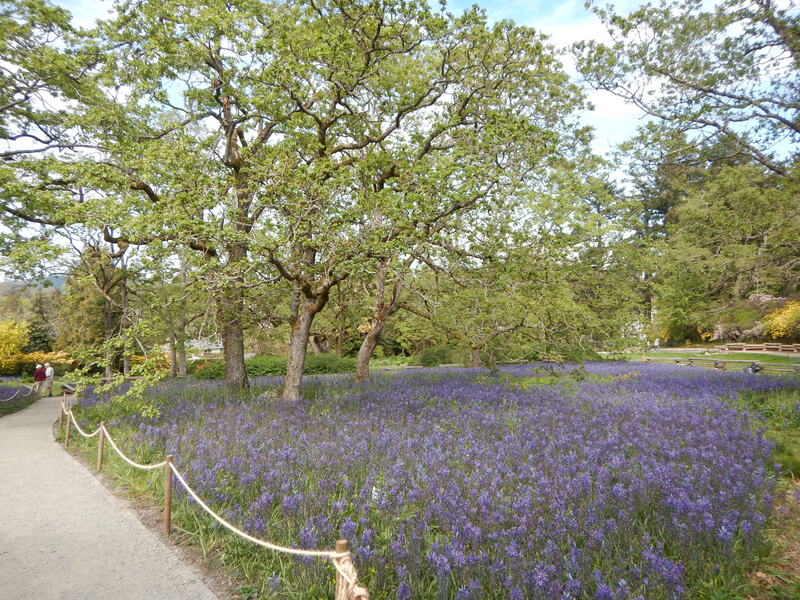 Even its ferny foliage contrasts the long straps of the Camas leaves. The flat tops are great landing pads for pollinators to gather their wits until they decide where in this smorgasbord to head next. 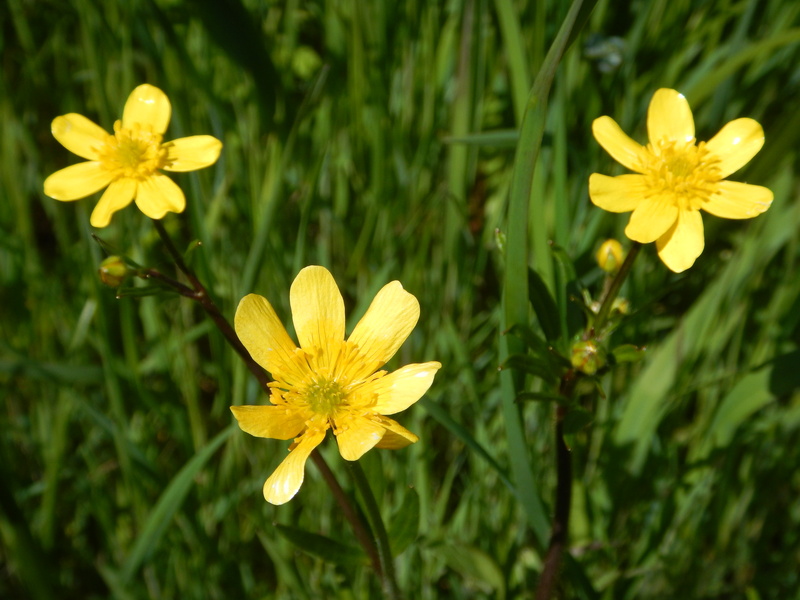 Western Buttercup (Ranunculus occidentalis) is the royal relative of the common creeping weed that is the bain of Seekers-Of-The-Perfect-Lawn. This tall cousin also has a long bloom, but is welcome in my garden anytime. Pacific Sanicle (Sanicula crassicaulis) is a sturdy plant with palm-shaped leaves at its base & small pom-pom flowers on tall stems. Its deep tap-root reaches moisture even when the summer drought kills off other plants. 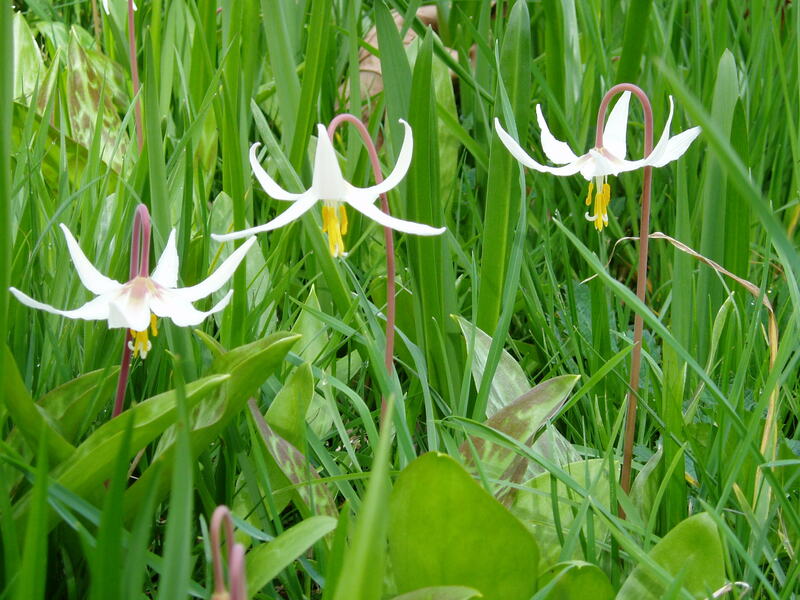 Fawn Lily (Erythronium oregonum) blooms early, often with the first of the common Camas. The white of the lily is a dramatic pop of contrast against the blue of the Camas. By the time the taller Great Camas blooms, the fawn lily bloom is completed and it’s setting seed. 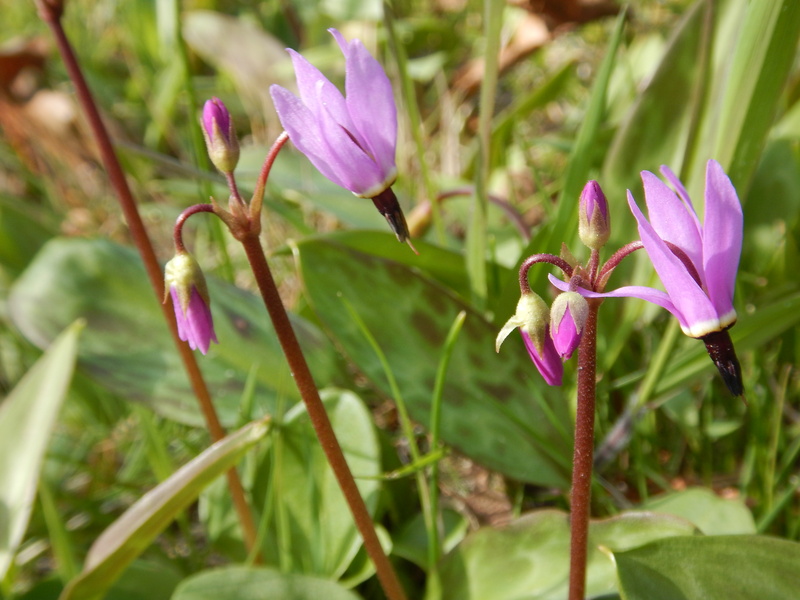 Shooting Stars (Dodecatheon hendersonii) are spectacular on their own with their delicate, cyclamen-like blooms. 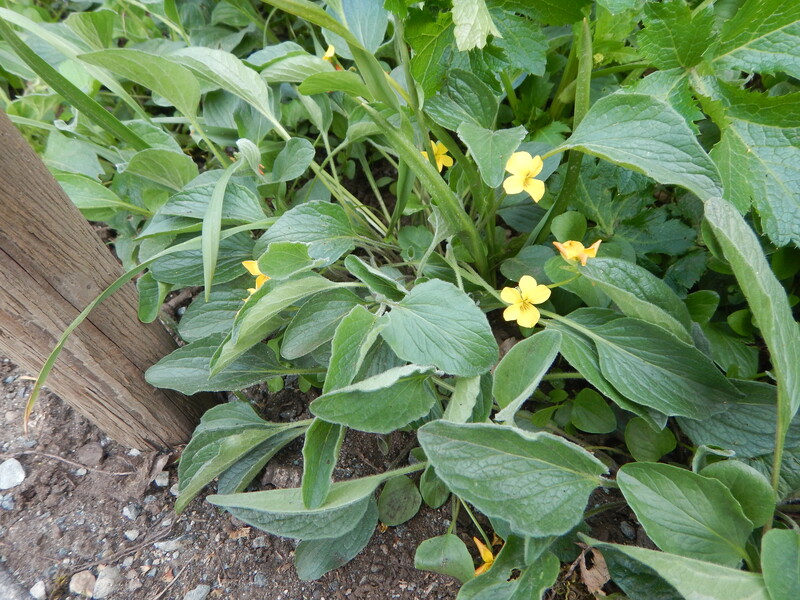 They’re early bursts of color in rocky outcrops and path edges. 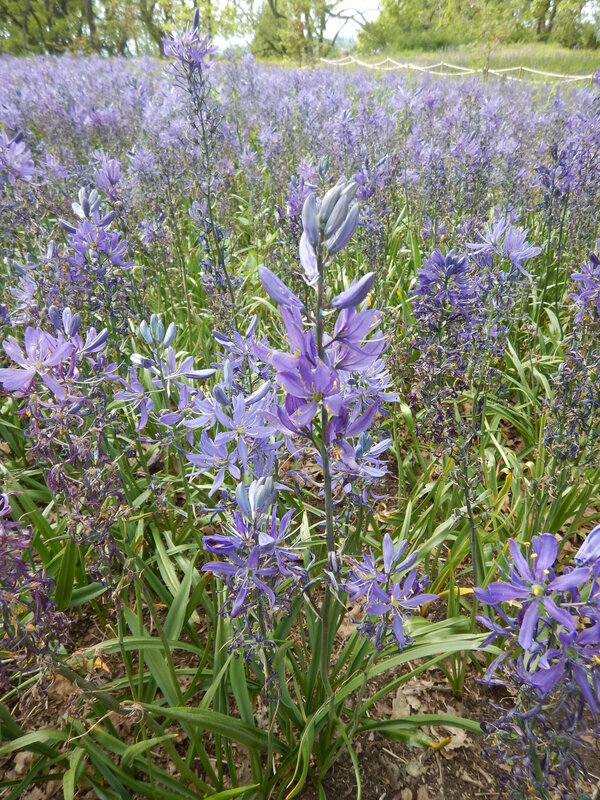 Once the taller Great Camas starts to bloom the Shooting Stars are easily overlooked. 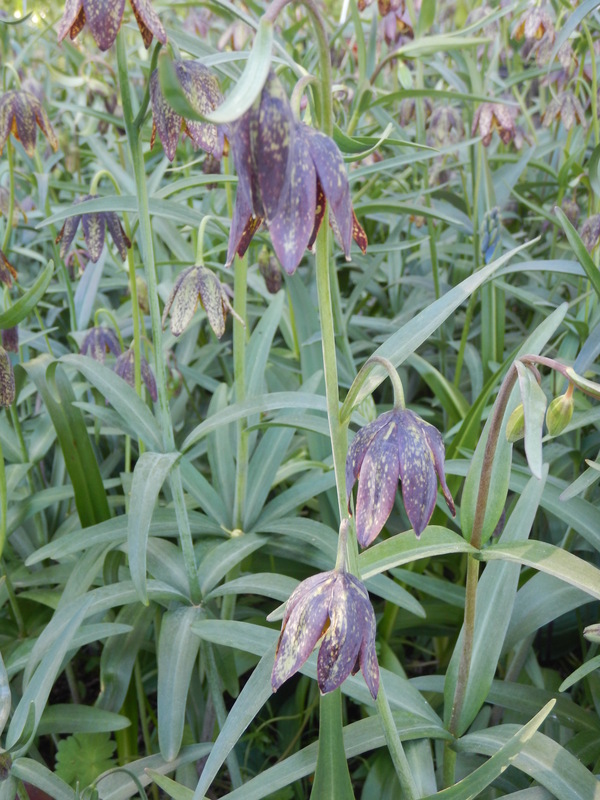 Chocolate Lily (Fritillaria affinis) is much larger in stature (knee-high) but its color is so muted that it’s also easily overlooked among the blooming Camas. Sightings are few & far between. SM spotted a patch of them beneath a tree & pointed them out, otherwise I’d have walked past unknowing. Perhaps there are more around than I realized… perhaps not. 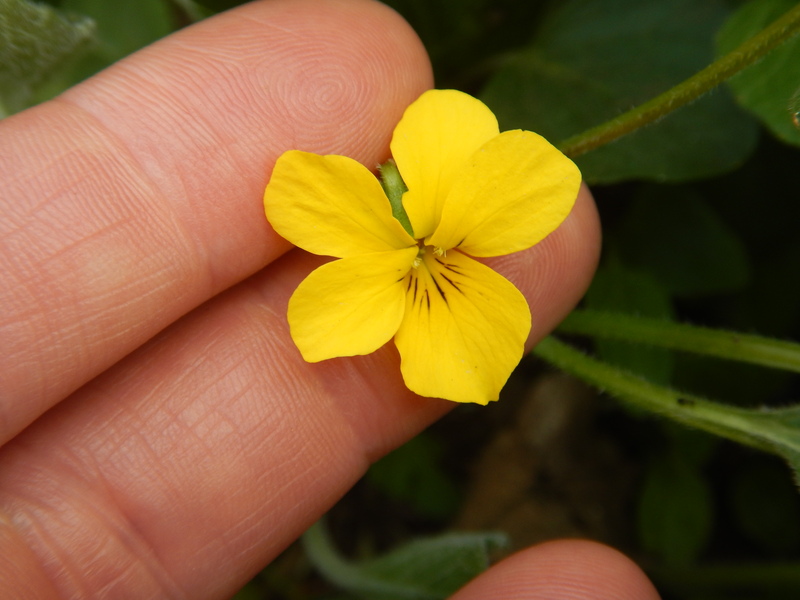 Yellow Montane Violet (Viola praemorsa) is the darling of the meadow. 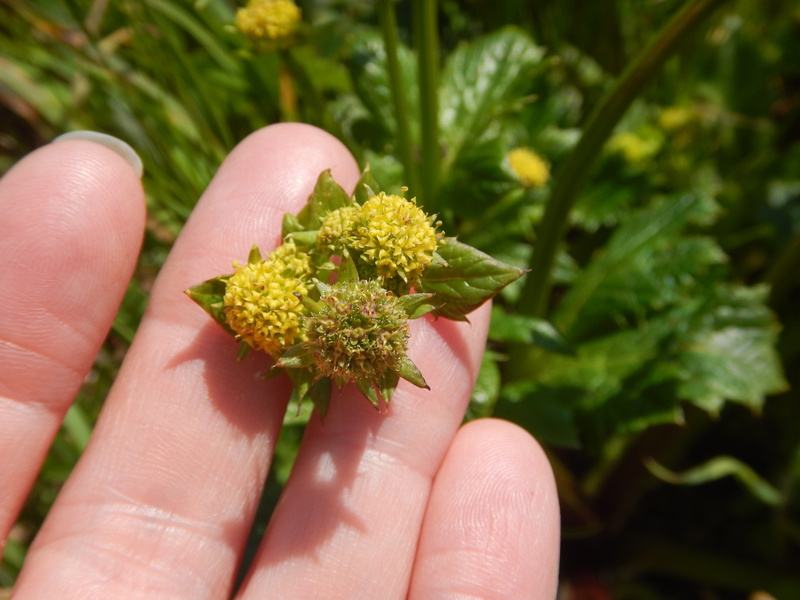 When Colleen first started the restoration, she was over the moon to find this endangered plant surviving. It’s red-listed in BC. Now, because of her attention, others have taken up the cause & also work at restoring populations. This piece of land has gone through many changes since colonization. I’m glad that it was protected from more intense development. In the 50’s the park was ear-marked for an arboretum, but that didn’t go beyond the incredible planting of rhododendron that’ve made the park famous for decades. I don’t think anyone really expected that those spring-blooming Rhododendrons would ever play second fiddle to this renewed native landscape. Colonization meets nature in this lovely garden.